As we head into the final stretch of the football season, the prospect of playing in a different league next year looms large. The only consolation for fans of relegated clubs is that they have a chance of bouncing straight back. For teams in contention for promotion or the play-offs, the dream of a place in the division above is still alive. But how big is the jump between leagues? The clubs relegated from the Premier League last May have for the most part had underwhelming seasons, with only West Brom still in contention for promotion. In the past ten seasons, only 9 teams have made it back to the Premier League on their first attempt. On the other hand, Luton Town still lead the League One table with only seven games to go, despite being newly promoted from League Two this season. Over the past five seasons, the average finishing position for teams newly promoted into League One is 11th, a comfortable mid-table position. So what does this tell us about the relative quality of teams across divisions? Looking at how many points a newly promoted team wins relative to the average club in that division, we can start to compare the strength of the leagues they have moved between. If a team is promoted into a significantly stronger division, we would generally expect them to perform worse than the average team in that league. 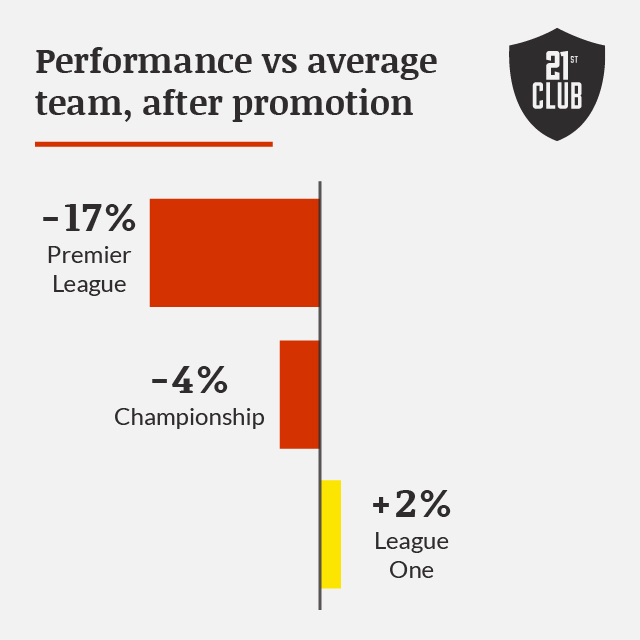 Clubs newly promoted to the Premier League often struggle, achieving a points total that is 17% worse than the average team. New arrivals to the Championship do better, but still perform slightly worse than the average team in that league. But teams moving up from League Two accumulate a similar number of points to the average League One team in their first season, suggesting the gap between the two leagues is fairly small. The story is similar across European countries: the gap is largest between the top two divisions, and the differences between leagues narrow after that. Teams promoted to La Liga do slightly better than their equivalents in the Premier League, attaining an average points total of just 13% less than the average side. New Bundesliga teams have generally had a similar record to teams promoted to La Liga and the Premier League, with the notable exception of RB Leipzig’s stellar debut season in 2016/17. 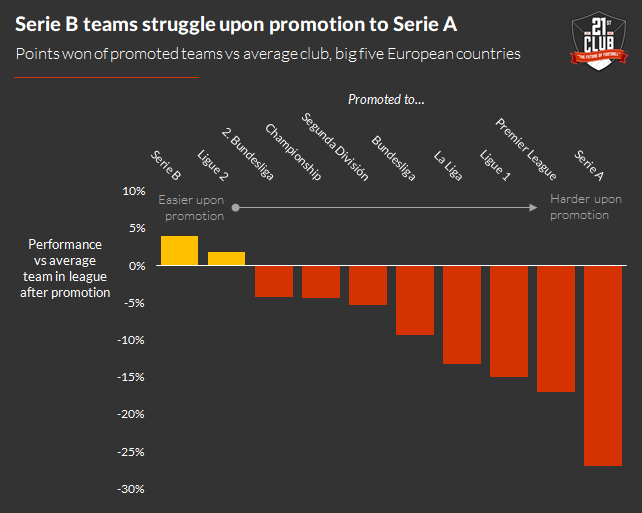 The jump between Serie B and Serie A looks to be the largest: newly promoted teams attained 25% fewer points than the average club. This points to where there might be value in European markets. Knowing that the difference between Germany’s first and second divisions is small compared to other major leagues could lead us to look for value in Bundesliga 2. And the narrow gap between second and third divisions across Europe opens up a large pool of players to clubs looking to recruit at Championship/League One level. Sophie Tomlinson has created 2 entries.